On Saturday, Sara and I were discussing the dismal forecast for the day’s bird count and commented that what I really needed was a Great Backyard Bird Count miracle. Back in the day, 2003 to be precise, we enjoyed a very special sighting out the apartment window during our first Christmas Bird Count. The bird was an American Kestrel, not our life kestrel but definitely the first one we’d seen in the Bronx. Now if you don’t know what a kestrel is, you do not know what you’re missing. These pugnacious little pocket falcons are a dash tangerine, a splash ultramarine, and a whole lot of just plain mean. The thrilling realization that a blue and orange raptor was hawking sparrows right outside our window was truly a Christmas Bird Count miracle. Unfortunately, while kestrels were a welcome sight for years after that initial observation, many months had passed since our last loving looks. I really had no hope that our old friend would drop by, even on this auspicious weekend. But they don’t call the GBBC the most wonderful time of the year for nothing. There I was casually sorting starlings from pigeons when I noticed a familiar silhouette provocatively pumping its tail at the top of our trusty tulip tree. Even before I reached for my bins, I knew the improbable had become actuality. For about five minutes, the kestrel basked in the adoration of its nostalgic fans, then streaked towards some distant sparrow, perhaps never to return. Even if it doesn’t, we’ll always have the 2008 Great Backyard Bird Count! Excellent! 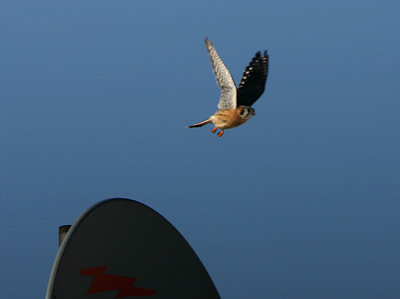 Kestrels are such awesome birds. Congrats on the kestrel; always a great thing to see. Why don’t you redefine your back yard as I do and go count in some richer area? I can’t see much out of my DC apartment window (though I do get a pretty rich variety of songs in the spring & summer), so I call Rock Creek Park my back yard since I am right next to it) and cover as much ground as I feel like. I got 25 species in a little over 3 hours, all in the city. I agree with Greg. When I was in DC, I made the Arboretum my “backyard” for GBBC purposes. The kestrel is a great sighting for the Bronx, though. Expanding the count beyond one’s backyard, particularly when one’s yard is an urban agglomeration of rooftops and asphalt, is a fine idea. In fact, I did take my GBBC show on the road to a local park to add hordes of Hooded Merganser and a bright Belted Kingfisher. It’s certainly legal for count purposes but doesn’t feel the same as watching from my living room. I also took my GBBC on the road and was rewarded with a Harrier, Flicker, Pileated Woodpecker and my own miracles – some roosting LEO’s. We drove over Liberty Reservoir, and were rewarded with not the Canadian geese that we were expecting. Instead, I saw my first Bald Eagle in flight in a natural surrounding. Way cool. He flew over the lake, caught a small fish and flew to the woods on the other side. Despite waiting and wtching, that is all we saw of him/her.